Of course, one interesting feature of this entire affair is the fact that these two groups were headed by Black Caribbean men. That is exceptional, as a matter of fact and it required a serious break from our past to develop the required levels of investor confidence. But the differences are even more interesting than the similarities – for example, it seems that AIC Finance has declared the true position and alerted its stakeholders properly as to its exit strategy. The characterisation of this situation as being ‘Duprey’s fate’ made me smile. Quite frankly, that phrase seemed to be a device to create some public sympathy for Duprey when the facts are of another type altogether. Amount – The amount of public money to be advanced is unspecified. Despite various official statements, this did not form part of the first MoU. The press release on the second MoU of 12th June 2009 was also silent as to the amount of money to be advanced in this CL Financial bailout. Collateral – The original MoU specified that certain assets were to be disposed of to repay the funds advanced from the Treasury. That position was soon overtaken by reality when the Central Bank Governor announced on 7th April that all of CL Financial’s assets were already pledged – http://guardian.co.tt/business/business/2009/04/08/govt-left-empty-handed-cl-financial-bailout. The second MoU and recent statements by Mariano Browne, Minister in the Ministry of Finance, make it clear that no fire sale of assets will be undertaken. To quote the Minister, speaking on 15th October – “One needs to be judicious in terms of the managing of the assets at CL Financial Group, given the depressed state of the market both here and internationally. There is certainly no intentions (sic) of selling the assets. The position is to manage them and manage them well” http://guardian.co.tt/business/business/2009/10/16/browne-no-plans-govt-increase-shares-rbl. If we are to believe the Central Bank Governor and the Minister, there being no good reason to doubt either one, it seems that these advances are taking place without security. Interest rate – The first MoU and the press release on the second MoU are both silent as to the interest rate charged. Payback period – There is no stated period for repayment of the public funds advanced. There have been recent announcements as to the government taking over management of the CL Financial group for 3 years. What fate? – Having arranged an urgent package of rescue financing on those terms, it seems that the shareholders of CL Financial have not had their equity position diluted and further, that Mr. Duprey has been allowed to keep all his personal assets. That is Duprey’s fate. That summary is the best I can give, based on the limited information available to me. If it is an accurate one, the CL Financial bailout is tantamount to a huge injection of public funds to bolster the private interests of only 325 shareholders, the main one being Lawrence Duprey. That is a real shame, given the state of our nation’s finances. The greater pity is that this is all taking place without proper public accountability or transparency. So far the Minister of Finance has not replied to my various attempts to get further information on these matters. But how much blame can we place on our rulers? Our society is shaped by our collective aspirations, attitudes and actions. But the notion of collective values is an increasingly doubtful one in this arena. Insofar as the national economy is concerned, do we actually possess collective values and if so, who can say with certainty what those are? More and more, it seems that the real question is ‘Whose values will prevail as we go forward’? The progressive people in the society have a duty to make their voices heard, if we are to have a chance of influencing others. If we influence others to improve standards, then that is a positive move towards the inescapable future. This CL Financial fiasco has been marked by the silence of the responsible people in the society. The nation seems to have been so heavily invested in the CL Financial group that the bailout was greeted with widespread relief. So much relief, that we seem to have taken our critical eyes ‘off the ball’. On 19th October I wrote an Open letter to the Institute of Chartered Accountants of Trinidad & Tobago (ICATT) to seek their involvement in calling for greater transparency and accountability in this entire bailout. That letter can be found at www.afraraymond.com. The week 19th to 23rd October was Accountants’ Week. 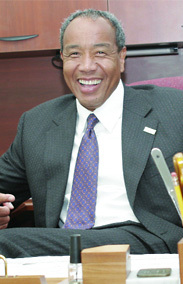 The President of the ICATT, Anthony Pierre, writing to open that Week, stated that ‘We have the opportunity to raise the bar on new standards in corporate governance, accounting, auditing and ethics” and “We do so mindful of our continued responsibility to contribute to the further development of our people, our institutions and our country”. I also intend to seek the involvement of other civic society organizations in promoting the calls for greater transparency and accountability in this entire bailout process. This series on the CL Financial bailout can be viewed or readers’ comments made at www.afraraymond.com.